Evergreen grey/green leaves and peeling cream and silvery-green bark makes Eucalyptus pauciflora Niphophila a popular choice for winter interest. Creamy white flowers in summer attract bees and the aromatic leaves have a slender eliptical shape that looks beautiful all year round. Young leaves are rounder, while young shoots are pink-red with a white sheen. The small size and upright shape of this evergreen Eucalyptus makes it a wonderful architectural tree for small gardens. 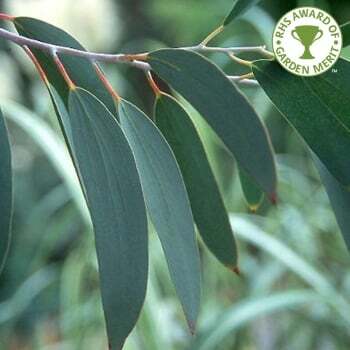 Low maintenance and considerably smaller than Eucalyptus gunnii, Eucalyptus pauciflora Niphophila can be pollarded or coppiced to provide a multistem appearance or hard pruned to maintain the foliage shape of a young plant. Tolerating poorly drained soil (not waterlogged), this Snow Gum tree grows in most soils, preferring slightly acidic. Benefiting from shelter when young, it can cope with more exposed sites as it matures. Eucalyptus trees do not take well to their roots being disturbed, so plan your planting position carefully - the size we sell is the largest size that we think is viable for transplanting. Snow Gum trees require formative pruning in the first few years. This should be carried out between February and March. The key thing to remember when pruning a Eucalyptus Pauciflora Niphophila tree is to never cut the central leader stem.